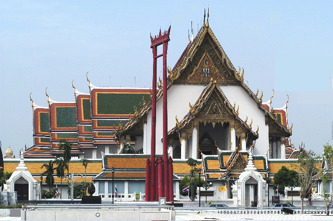 The temple was started by Rama I, but was only completed by Rama III. It took a total of 27 years to complete the temple. 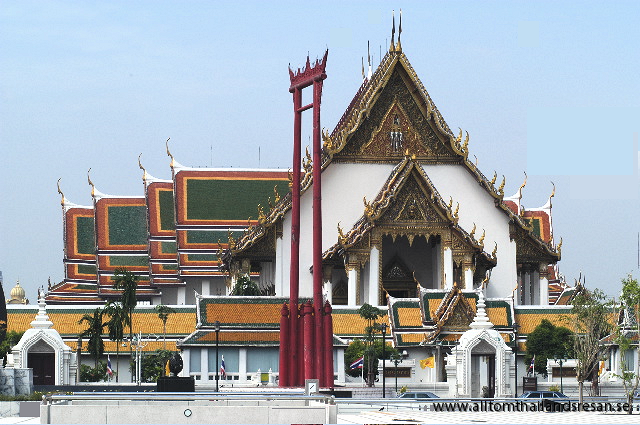 The large viharn is very elegant with graceful proportions, and no doubt it is one of the most beautiful monuments the Bangkok period has left behind. Viharn surrounded by an open gallery with 160 golden Buddha figurins. viharn itself is built on two platforms. On the bottom, there is in every corner of bronze horses and Chinese stone pagodas. On the top platform stands in each corner a small pavilion with Buddha figures. The building's two ends are symmetrical with many decorations, among others. the three-headed god, elephant Erawan, and other religious figures. Note the soldier figures that guard all entrances to this attraction in Bangkok. They have all the uniforms and hat. all Asians believed that Europeans wore a hat. Sanctuary interior is dominated by the large Buddha figure #Phra Buddha Chakyamuni "originally stood in Wat Mahathat in Sukhothai. Buddha performed on Rama I's request to Bangkok on the river in the early 1800's. It is one of the finest examples of Sukhothaiart and maintained following all the rules. The Buddha is made of bronze, about 6-7 feet tall and is from the 1300's. Even the walls are remarkable. They are covered with frescoes from the early 1800's. Behind viharn is a building built between 1839-1843 by Rama III It is only rarely open to visitors. It does not have the same architectural qualities as viharn, but some well-preserved frescoes. Each of the 24 panels that are different from each other show scenes from Buddha's life. The covers illustrate "Indra's celestial city" Furthermore, there is a sculpture group with a statue of "Phra Trai Lok chet" Preaching for listening monks.